One of the questions that so many of us have is how to deal with happiness and if we find it can we let go of the past? Is it at all possible to change destiny? Gil is 21 years old and has no money. This is difficult for him because he feels fulfilled by poetry and music. He finds himself constantly questioning the world around him. It took a family quarrel to make him run away from home and leaving behind the only love he has ever felt in his life—his Aunt Leila. 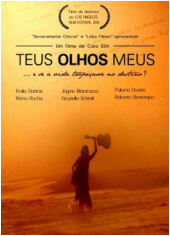 Yet he had a stroke of luck in meeting Otavio, a music producer who could change his life forever. This is the first feature film by director Caio Son and he concentrates on male friendship and sexuality. Here we have two straight or heterosexual men who find a love relationship with each other. For each man, Otavio and Gil, this kind of relationship had been elusive. Sóh brings us a dramatic film with quite a shocking twist at the end. We experience the emotional tidal waves of two men in love. The characters propel the film and both of the actors turn in brilliant performances. Remo Rocha is Otávio the rock of the relationship. He is a man whose dormant passion for life is awoken upon when he met Gil (Emilio Dantas) on the beach. We see Gil as a pot-smoking wild card of the piece— he is an aspiring, if at times drunk musician who comes to find his heart, together with his body seeking solace in a direction he never thought it would go. We do not see them making love but we do see them in bed after they had and we sense their deep love for each other. Their kisses are passionate just as is their relationship but it feels quite real and sincere. We are introduced to Gil’s aunt who loves him dearly but she is married to a man who abuses her. We see what Aunt Leila has with husband Cesar as the opposite of what Otavio and Gil have together. There is a lot of juxtaposition to show this to us and flashbacks fill in Otavio’s back-story. However, the spotlight is fixed on the relationship between the two men, as Gil, at first repulsed by his latent homosexual awakening, gradually comes to accept his sexual self and moreover his love for a man older than himself. Only as the film comes full circle, a critical scene is missing and whilst there can be little doubt as to its outcome, it still is left begging to be explored.